I am Mr Mark Elvis. a computer scientist working with central bank of Nigeria. I just started work with C.B.N. and I came across your file which was marked X and your released disk painted RED, I took time to study it and found out that you have paid VIRTUALLY all fees and but the fund was not released to you. The most annoying thing is that they won't tell you the truth that on no account will they ever release the fund to you, instead they allow you spend money unnecessarily, I do not intend to work here all the days of my life, I can release this fund to you if you can certify me of my security. 15) Dr. Godwin Oboh: Director Union Bank Of Nigeria. 16) Mr. John Collins: Global Diplomat Director. Subject: THE TRUTH ABOUT YOUR UNPAID FUND/FILL THE FORM AND SEND BACK. In response to your mail concerning your funds, please note that I am willing and ready to get this transfer done today, that is the reason why I contacted you to make it happen, I just started work with this ministry for not quite long, going to 2 months now and I have not really made any savings and cannot depend on any one to make this happen rather than you and me, so all I require now is your full co-operation And trust and in God we trust all will be successful. Be informed that you are advised to stop contact with any other office and to direct your attention on completing your transaction, below is the transaction code to avoid any hitch on the transfer of your funds. To proceed with the completion of your transaction I advice that you copy out your transaction codes. Secondly i will advice you on how to complete this transaction, The only thing needed to release this fund is the Anti drug/terrorist clearance certificate which will be tendered to any of your nominated bank and the INTERNAL REVENUE SERVICE(IRS)for clearance of the transferred amount in your account, without the certificate the INTERNAL REVENUE SERVICE(IRS)will believe the funds was obtained illegally and you could be charged with money laundry which is punishable under the money laundry control act of 1986. 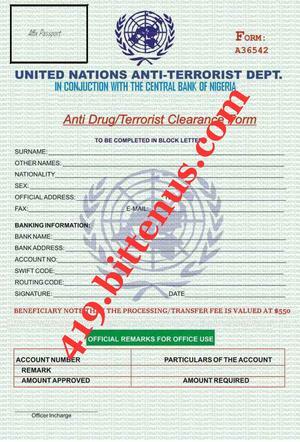 Note I think those people you sent money are not who they said they are, they are wrong people because you now communicating with the right office and also know that Once the Anti drug /terrorist clearance certificate is obtained funds will immediately reflect in your bank within 10 Minutes through our (ETT) ELECTRONIC TELEGRAPHIC TRANSFER, the certificate is all that is needed to complete this transaction. Note that at the presentation of the processing/transfer fee valued at $550 which is the only fee required, your funds will immediately reflect in any of your nominated account. A document is below fill it and submits back to me.